England scout Alan Cork said he feared for his life as he watched France play Germany amid the Paris attacks on Friday night. 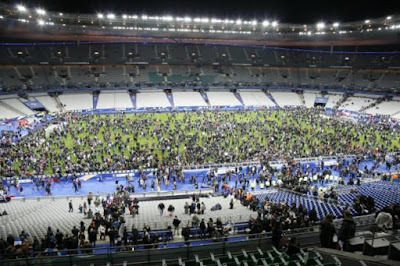 Cork, 56, was at the Stade de France to watch France, England's opponents on Tuesday, when the stadium became a target of terrorists amid a series of attacks across the French capital which killed at least 132 people. Three suicide bombers blew themselves up outside the stadium after failing to gain access. The blasts were heard inside the ground, and Cork said his colleagues alerted him to what was going on. "We felt like fish in a barrel," the former Wimbledon and Sheffield United striker said in The Sun. "I was wondering if I would get out of there alive. You put a brave face on it but inside I was frightened, I can't deny it." He added: "People were desperate to get out, because we were hearing these stories of men with machine guns trying to get in. All sorts of thoughts were running through my head, about my wife, about my kids. "You just don't expect to experience these things at a football match. It's not meant to be like that." The former Cardiff and Swansea manager will not be at Wembley for Tuesday's friendly with France - he will instead head to Hannover where Germany play Holland - but backed the decision for the match to go ahead. "Friday was terrifying but you can't let these people win," he said. "That's why it is so important that England's friendly against France goes ahead on Tuesday."